Dennis & Dusty Keener are a father and son team, having fished Lake Eufaula's 600 miles of shoreline for all of their lives. They guarantees to get you on fish; crappie, sand bass, catfish as well as seasonal night Bowfishing Trips for Gar, Carp & Buffalo on Lake Eufaula. Whether you are new to fishing ot an avid fisherman, you will have a great experience with us. 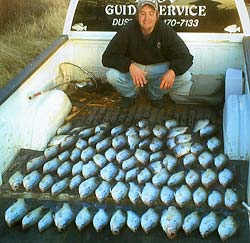 Come and enjoy the fun and friendly Oklahoma hospitality with D & K Guide Service.